Santa Fé de Nuevo México, a province of Nueva España and the Crown of Spain. In the far corner: Po’Pay and the Pueblo Indians. Under the authority of King Philip II of Spain, Juan de Oñate traveled north from Mexico City in 1598 and established the territory of Santa Fé de Nuevo México as a province of the Viceroyalty of New Spain. Don Juan seems to have fallen afoul of the powers that were, and it was left to others to complete the settlement or conquest (depending upon your viewpoint) of the land. In my mystery novel, The Zozobra Incident, the first of a series starring Licensed Private Investigator Burleigh. J. Vinson (or BJ, as he is thankfully known), we get a glimpse of the contemporary City of Santa Fe. In fact, during the Burning of Zozobra, we are exposed to a tiny bit of its history when BJ explains the ritual to a companion. 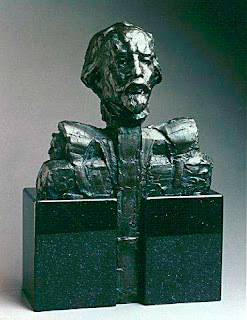 His explanation centered on the province’s problems with a character named Po’Pay (also spelled Popé) and his rebellion. La Villa Real de la Santa Fé de San Francisco de Asis (the Royal Town of the Holy Faith of St. Francis of Assisi) was founded by Don Pedro de Peralta in 1608. In 1610, he declared it the capital of Santa Fé de Nuevo México. Traced through this lineage, the city we now know as Santa Fe is the oldest state capital in the Union. At an altitude of around 7,200 feet above sea level, it is also the highest. According to the New Mexico Blue Book (2001-2002), the town was laid out according to a certain set of rules. For example, towns must have a central plaza measuring 100 varas long and 75 varas wide. A vara is 33.99 inches. Streets (each 10 varas in width) ran at right angles for a distance of one league (about three miles) in each of the four cardinal directions. Tradition dictated the church entrance was from the east and faced the plaza. Things went swimmingly for the Spaniards (if not so much for the indigenous peoples). The Franciscans aggressively pursued the conversion of Indians to Christianity, forbidding sacred dances and seizing masks, prayer sticks and effigies. Po’Pay, a shrewd Tewa religious and political leader from San Juan Pueblo (it was Ohkay Owingeh to the natives) and forty-six other Pueblo leaders were arrested and accused of sorcery. Four were sentenced to hang (three did, and the fourth committed suicide) while the others were beaten and sentenced to prison. When Pueblo pressure forced the release of the imprisoned leaders, Po’Pay plotted his revenge. Many of the Pueblos, which did not have a tradition of cooperation, united under his leadership for a rebellion against Spanish rule. Knotted cords were sent to each village with instructions to untie one knot each day. The uprising was to begin on the day the last knot was untied. Security surrounding the planned revolution must have been pretty good. Po’Pay had to move up the date of his attack by only one day when two messengers were caught with knotted cords. He struck on August 10, 1680. Most of the Spaniards in the territory, estimated at about 3,000, retreated to Santa Fe where they remained under siege until August 21. On that day, Po’Pay allowed all of them to pass unharmed down the Camino Real (the Royal Road) to present day El Paso, Texas. During the revolt, 21 one of the 40 Franciscan friars in the territory were killed together with around 380 men, women, and children. Some accounts put the death toll at 22 out of a total of 33 friars (which tells us something about the underlying problem). The newly purged territory blossomed with peace and prosperity once the foreigners were thrown out, right? Well, maybe not. The Indian villages were spread over hundreds of miles and spoke eight different languages. History is a bit murky after the expulsion. Some claim Po’Pay attempted to set himself up as king and tyrant. Others say he retired from a leadership role after the revolt. Historic rivalries among the various Pueblos soon resurfaced when the need for cooperation against the invaders was no longer pressing. At any rate, Po’Pay died in obscurity somewhere around 1688. The Spanish were not to return until 1692 when Don Diego de Vargas and an army of 60 soldiers and 100 warriors under a Zia war chief retook the province and re-established royal rule. However, unrest and scattered resistance continued until the end of the century. One would think the valiant Don who recaptured the territory for New Spain would be one of New Mexico’s greatest heroes…and, indeed, he holds a prominent place in our history. But it is the elusive, shadowy Po’Pay whose marble statue occupies one of New Mexico’s two spaces in the United States National Statuary Hall in the Capitol in Washington, D.C. While Po’Pay’s Revolt rid the territory of Spanish conquerors for only 12 short years, the rebellion prompted the Crown acknowledge Pueblo sovereignty, set aside grants (which kept the Indians on their ancestral lands), and agree to stop trying to eradicate the Pueblo cultures and native religions. 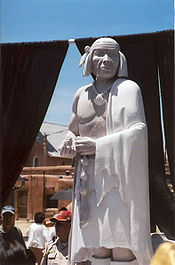 The figure of the Pueblo leader, done by Jemez Pueblo artist, Cliff Fragua, shows Po’Pay holding one of the famous knotted cords. Who is Burleigh J. (BJ) Vinson?